The words which come to mind when thinking about London’s Games Makers include: cheerful, flexible, engaged, optimistic, generous, confident and dedicated. Collaborating with Olympic Volunteers on The Last Mile has been a joy and a privilege. I say collaborate because, despite being paid to manage an area around Greenwich Park, interaction with volunteers has not been anything like work. Not a grumbler or egoist in sight, operations have been made fun, easy and pleasurable. And, given half a chance, I’d hire each and every one five times over. The Volunteer Games Makers are living proof that a positive frame of mind and a healthy dose of good-will goes a long way. And side by side with our athletes, the volunteers have done much to inspire a generation – reigniting our appreciation for cheerful and honest service, for generosity, camaraderie and personal responsibility. David Cameron captured our collective admiration well when he said he wished he could bottle Games Maker spirit. So as many of these wonderful volunteers prepare to go back to their pre-Olympic lives, and we wait to meet a new round of happy faces at the Paralympics, it leaves me wondering: what can Londoners do, individually and collectively, to try and preserve the volunteer legacy? I imagine there are many ways to emulate the example set by volunteers… but here are a few questions to help us kick-start: Can we continue to smile at strangers on the street? Can we step back and let people pass rather than push and shove onto public transport? Can we stay away from the office water-cooler and give each other the benefit of the doubt? Can we believe in ourselves and the prospect of making a difference? Can we give before expecting to receive? Can we be positive despite the temptation to criticise and complain? Can we remember that the things which divide us are less than the human needs and goals which unite us? Can we make time to be kind… perhaps stop and have a laugh with someone we might otherwise have ignored? Or, can we simply volunteer? 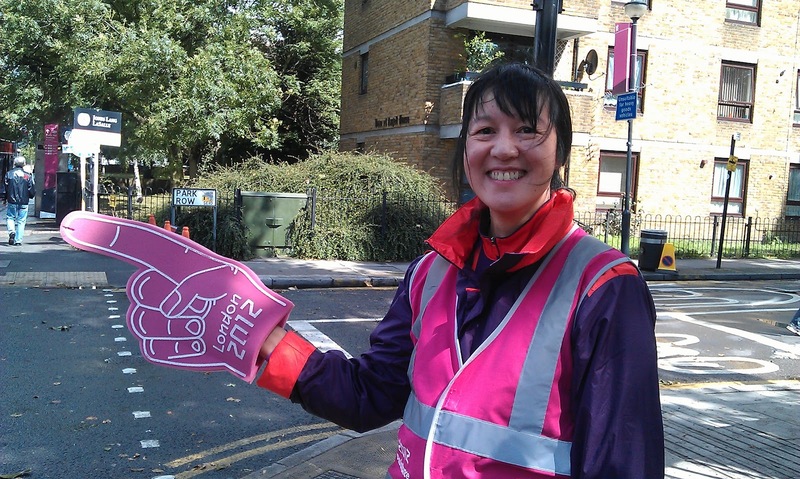 If you think that’s pie in the sky, then choose a few paragraphs below and allow me to introduce you to a selection of the inspiring volunteers I found on the Last Mile route to Greenwich Park. Grant Speed is husband to Jo and father to Jake (6) and Alex (3). Born in Arbroath and living in Greenloaning, near Dunblane, he is a Group Financial Controller for a hotel company, the Jurys Inn. He used his holiday leave to come to London for the Games, and bunked down with relatives. Grant wanted to be a volunteer because he reached a point in his life where he realised he was not likely to be an Olympian in the truest sense. But, loving sport, and wanting to get involved behind the scenes, he knew that it doesn’t get any bigger than an Olympics in your home country. He also felt, being Scottish, that it was important the British Games were well and truly represented. Starting out Grant kept his expectations in check. He accepted the days would be long, and that he might be miles away from stadium, standing in the rain… but he also knew that “these things are what you make them”… and that “getting involved is the only way to make things happen”. The fun continued: Grant wore sympathetic sideburns to see “Wiggo win gold”, and delighted in the joy he observed in a crowd of Japanese spectators standing in the rain to watch the Women’s Marathon. In his travels he reports to meeting “princesses, athletes and former soap stars” but, to Grant, the volunteers were the “greatest bunch of people”. Finally, he added, “sneaking into the Greenwich Arena to watch competition while I ate lunch on a couple of occasions, beats any lunchtime, anywhere!” And I’m sure there’s not a soul who would begrudge our volunteers such a moment of reward. 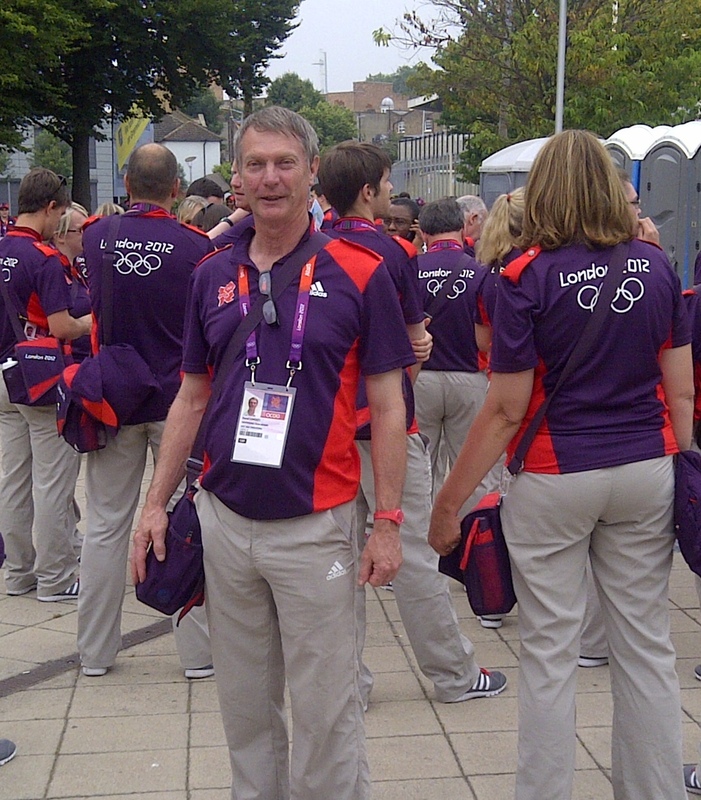 Graham appreciates that, in order to have the Olympic experience, he has been “lucky enough to have a very supportive wife, family and work colleagues.” He took twelve days off work “at a point where there really is no spare resource… but my manager was aware of the opportunity I’d been given”. In order to honour his volunteering commitment, Graham needed to move down from Wales to stay with family on the outskirts of London, and most impressive is that this involved leaving behind his loving wife with their five year old daughter, Evie, and their twelve week old son, Archie! “To say I am immensely proud of what I have been involved in, is understatement.” Graham’s had lots of text messages of support from friends and family but admits to getting slightly emotional after reading a text from his dad on the golden Saturday night after Team GB won all the medals. The message read: “Proud to be British today, but more proud of you for volunteering x.” Graham concluded our discussion with: “I can't wait to get home and bore people with all the stories - over and over again!! !” And no doubt he’ll generously thank his patient wife and boss for their contribution! Donna is a woman well accustomed to a profession of service, and first hand I greatly appreciated the good cheer and quiet professionalism she brought to the Last Mile Team! Aurélien Urbanek (27) is a French national who grew up in Paris. Pictured here with myself and Eva Paterson, another dedicated volunteer from Scotland, when Aurélien isn’t working on the Last Mile at Greenwich Park he works in Marseille as a Civil Engineer. When asked about the nature of his Games experience, this self-effacing and impressive young man went on to say: “The experience has been great. When I applied to become a volunteer, I didn't imagine that the atmosphere would be so intense. People are just amazing. The public is showing a great sympathy toward the volunteers and especially with the Last Mile team members. But above all, it's been such a pleasure to work with the other volunteers. I've discovered so many different people, so many different cultures and experiences. I was a little bit surprised when I found that many volunteers are not coming from London… but from all over the UK and even from abroad. I have learned a lot during the Games and I will miss all the volunteers with whom I have worked. But my next step is to go back to France and share my incredible adventure with my family. I'm also thinking about volunteering for Rio de Janeiro in 2016... so I better start learning Portuguese before the interviews start!" “Clearly I couldn’t commute from Wales, but the cost of hotels in London during the Olympics was high if added up over a couple of weeks. 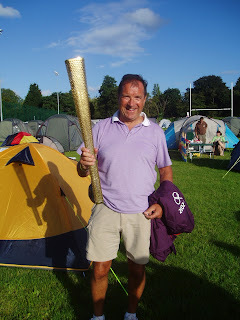 So through www.campingatthegames.com I stayed at Blackheath Rugby Club. It was fantastic, and even better was that the revenue raised is to be put back into the running of the rugby club; thus benefitting the local community and creating a lasting legacy. The camp site was excellent, and packed with Games Makers. There was a cafe providing breakfast and hot meals throughout the day, and a fabulous bar where we could watch the Olympics and meet fellow campers. This bar had a wonderful atmosphere, and when GB won a medal the roof was raised! The campsite was only fifteen minutes by bus from Greenwich Park which was another bonus, especially as some people were commuting for several hours each day. “The company was started by my father in 1982 so we are celebrating our thirtieth anniversary in this most special of years. I work with solely residential property and I still remember exactly which house I was in when the decision was made to give the Games to London in 2005. I surprised myself with how much this seemed to mean to me (and the strangers I celebrated with), and decided there and then to try and get involved. At the time I was a callow 42 year old with a successful company, and I naively thought I’d be able to easily afford to take two weeks off to volunteer. As it happens... business took a significant downward turn in 2008 and though the company kept going, my Dad retired, and my wife went up to the city to work rather then managing my office. Nevertheless I kept my promise to myself and applied to be a Games Maker as soon as it was possible. I chose Greenwich because I love it and know the area well. I have no sporting qualifications really (except as a scuba diver), so I knew I had to be prepared to do anything and that seemed just fine. What I was looking forward to was the team spirit and I have not been one bit disappointed in that regard. I work on my own an awful lot and so miss the camaraderie (if not the politics) of having workmates. David has not been disappointed. He has been “thrilled with the sporting atmosphere which has emerged in everyone, so refreshingly unmaterialistic…” and with his experience of the ethnic diversity of London. His experience, he says, has been “absolutely brilliant”, and again he reminds us of the positive energy which emanates from people when they are tuned in to the notion of ‘giving something back’. Originally from Manchester, Derek Lucas, 67, lives in Congleton Cheshire. He’s been married to Lorna for 45 years and has 2 daughters, Rachael & Rebecca; both married with children. Derek took retirement in 2000 from his position as Agricultural Manager with a major UK bank. He has also lectured in related banking topics for over 35 years. 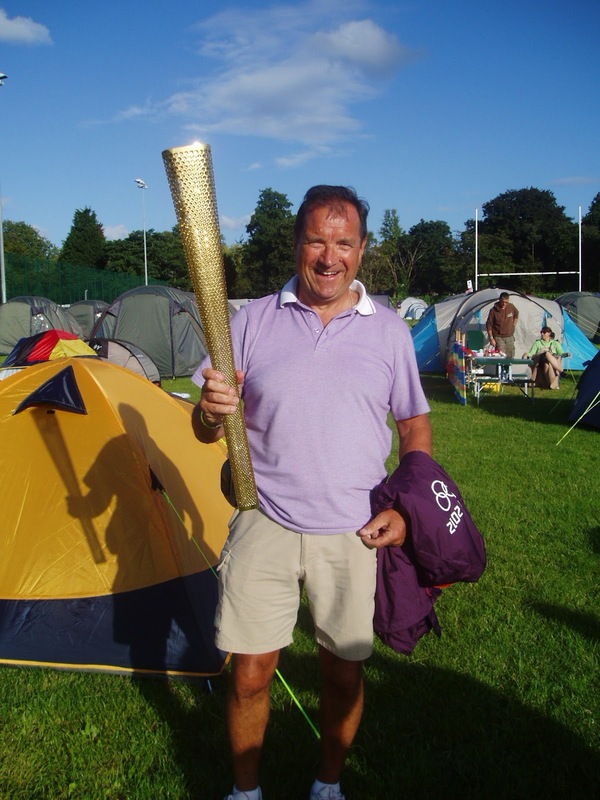 Involved over many years in running clubs and athletics, in 2002 Derek volunteered to work at the Manchester Commonwealth Games. As a driver, he acted as a chaperone for athletes who were randomly chosen to take a drug test. So when London was awarded the 2012 Olympic Games he knew immediately he wanted to take part in what he described as a “momentous event”. 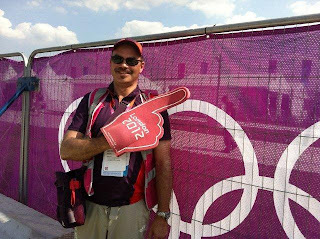 Though initially disappointed not to be placed in a role closer to the athletes, Derek’s story of relocation and throwing himself fully into the spirit of the Games is typical of so many resourceful volunteers, that you could almost say he experienced The Real Olympic Park. Living over 200 miles from London, finding accommodation quickly became a priority for Derek. Due again to cost, hotels were out of the question. Nor did he know anybody in the area who could offer a spare room. Yet Derek came across Ninja Camping who were arranging with sports clubs across London to use their facilities for camping. Like Rhian, he arranged to camp on Rugby Club grounds, this time at Eltham, where, for a mere £10 a night, he had 24/7 hot showers, meals, bar, and access to a bus which took him directly to Greenwich in thirty-five minutes. Of the 250 tents at this site, Derek reports about a third were volunteers, the rest Olympic tourists. And cleverly the volunteers were placed all together on a quiet part of the field and bonded accordingly. So where does the volunteer who went home with an officially presented certificate in his bag declaring “The Most Energetic Last Miler” go from here? His reply: “The Commonwealth Games, Glasgow 2014. If they want volunteers I am their man!” And all evidence shows they’d be lucky to have him! “I've been volunteering to support equestrian sport for many years, at local riding club events as well as national events run by the British Horse Society and Association of British Riding Clubs. When London 2012 called out for volunteers, I didn't hesitate. I just wanted to be there to do my bit to make London 2012 successful, and to soak up the atmosphere. 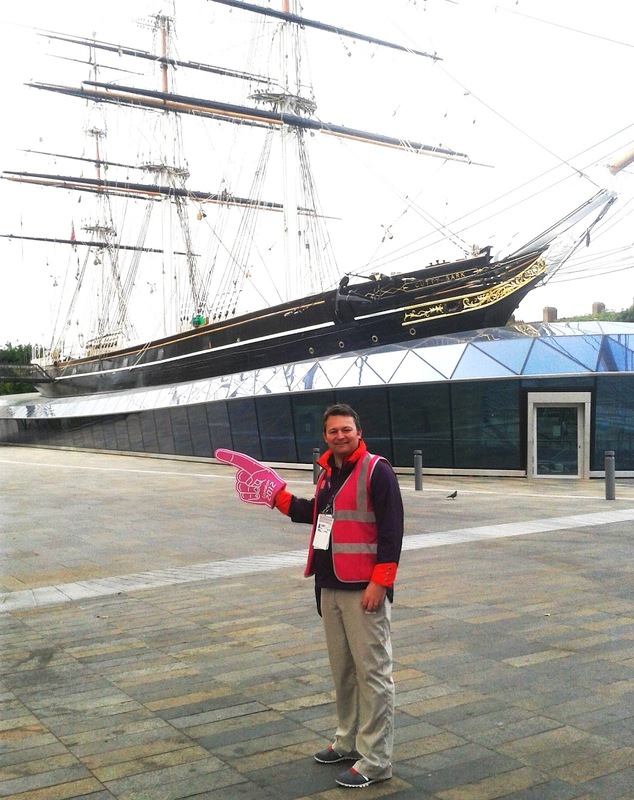 I'm a keen horse rider and put Greenwich as my top choice when I filled in my LOCOG application form. From the first day, seeing all the spectators at Greenwich, I knew it was going to be great fun. Everyone was in a good mood (even when the torrential rains came) and I just loved interacting with people from all around the world. 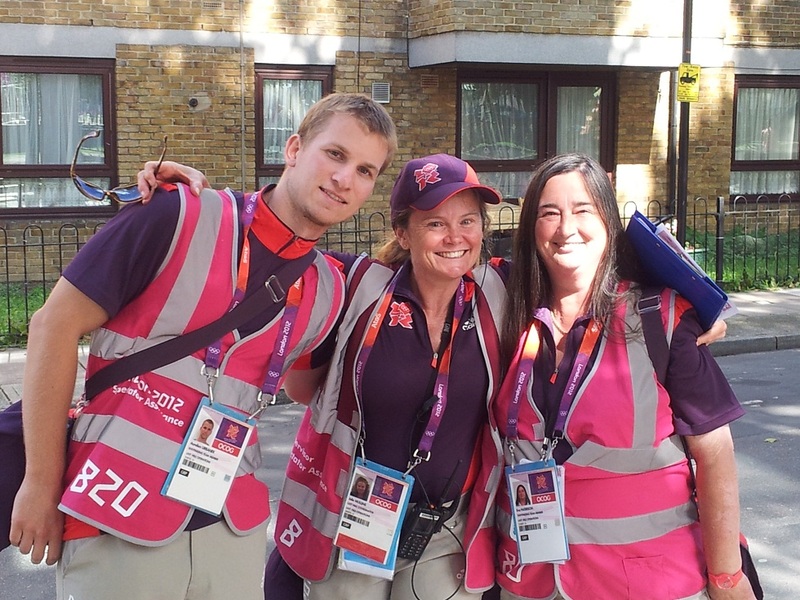 Everywhere I went in my Games Maker Uniform people spoke to me, wanting to know where I was working, what I was doing. But the biggest highlight for me, were my fellow Games Makers. They were all amazing, wonderful people. As far as I can tell there are three elements which make volunteers and volunteering so special: the first, is the generosity itself; the second, is the spirit of the giving; and the third, is the quality of the individual as a contributing and capable member of society. In the majority, these factors combine to create a most valuable collaborator, ready to perform all manner of tasks and roles with a first class attitude. Take the Olympics for instance: the volunteers, otherwise known as ‘games makers’, are second in importance only to the athletes. Individually and collectively they are making the wheels turn and adding not only immense practical value but the je ne sais qois we’ll all remember from 2012. Anyone who experienced the Sydney Olympics will understand what I mean. Already Londoners are talking about a different kind of friendliness evident on the streets, the warmth (literal and metaphorical) which is seeping under people’s skins and opening them up, such that Londoners suddenly seem less reserved, less suspicious. No longer am I the only person talking to others on the train unprompted. People are smiling, nodding, chatting, and for these precious days we feel less like strangers and more a part of something bigger than ourselves. Funny that competitive sport brings that on – when it’s the reserve, usually, of spiritual reflection – but on that count churches adjacent to most venues are also opening their doors to visitors for free cups of tea and the use of amenities (something highly appreciated when thousands of people converge in one location). Father Nicholas introduced himself to me on my first day of work near the Blackheath Live Site, offering similar welcomes, and his delightful neighbours, Gail and Peter, stored a box in their garden of the coveted ‘pink fingers’ over several nights so I didn’t have to lug a large box up and down the hill. The Police are out on horseback and bicycle, cracking jokes and ready to help. The Armed Forces are not only well dressed and easy on the eye, but also poised to help with whatever comes up. Yesterday, for example, a Marine by the name of Stu Hamilton resolved an access issue for about one hundred guests in my zone with some quick lateral thinking and a big smile. And all this rubs off on the spectators, who invariably greet and thank the volunteers (and the lucky paid staff amongst us) as they pass through The Last Mile in the thousands to get back on the trains and buses which are also operating with wonderful smoothness. When you call out “did you have a great day?” they reply with confident cheers, and only a few odd sods have teased me about Australia’s uncharacteristically subdued medal tally. Even on the busiest cross-country day when 50,000 spectators left Greenwich Park simultaneously, I stood on a raised section of pavement to announce in my loudest theatrical voice “no delays at Blackheath Station ladies and gentleman… TfL are doing a great job”… and they laughed and whooped… not one scoff amongst them! But back to the volunteers: you’d think it'd be their skill and professional experience which make them so valuable… and though that's palpable, it is first and foremost their attitude which is magical. Many are highly skilled: I’ve had doctors, teachers and senior managers in my team. Many live in other parts of the country and have negotiated to take leave from their jobs (and families) to come to London. Many are staying with friends and family, just as many others are camping on the city’s outskirts… ready to get up early in the morning or stand on their feet for shifts of up to ten and twelve hours. 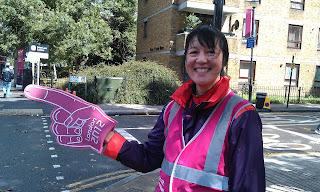 Yet still they wave those ‘pink fingers’, give directions and engage with the crowd, making anyone who is interested in the Olympics, in this once-in-a-lifetime-London experience, cheered and proud to come across them. Sometimes I get to mix and learn about the volunteers while on duty. Other times I meet them in the pub after work where the least I can do is buy them a pint (well, I’ve got Irish heritage and can’t possibly let them drink alone). But I never fail to be impressed by their character, enthusiasm and the complex arrangements they’ve had to make so as to be available for London over this period. So, I’m wondering: what does this evidence of Olympic spirit, and the volunteers in particular, tell us about humanity? I think it shows that people will rise to the occasion, give of themselves, tap good humour, look to give (rather than receive), when they are given half a chance to express optimism – to express the best of themselves. I also think it shows the supremacy of positivity and hope over negativity and suspicion, when we raise our sights above the horizon to embrace the big picture. Call me idealistic or romantic, but the evidence is there. And in the wake of a difficult financial climate across Europe, not to mention bad weather in Britain prior to this delectably-sunny aspect turned on for the Games, it is truly heartening to experience. I only wish I always got to work with people who are so universally positive! But I suppose it’s the lack of $ and ego in the equation which keeps it pure. Just for the record I would never say volunteers don’t deserve to be paid. In fact the opposite is true if you evaluate the general quality of their contribution. Where would charities and arts organisations be without such generosity? And I particularly think carers need to have financial relief and safety nets so as to take a break when they need it. But there is something unique and socially important about the extensive volunteering which takes place across many aspects of our ‘commonwealth’, for in many ways it’s a measure of the social health, generosity and vibrancy of a nation.